Old and new sign up for unified GC32 Racing Tour	With 10+ teams expected to take part in the five event series this, first to announce at Argo and a brand new campaign from Switzerland. With the GC32 flying catamaran racing circuits this year amalgamated on the GC32 Racing Tour, so at least 10 teams, including the GC32 teams from the Extreme Sailing Series, are due to compete on this season’s five event circuit that takes in some of the best sailing venues in Italy, Spain and Portugal. Participating on the circuit will once again be many of the world’s best sailors, including Olympians, Volvo Ocean Race winners and America’s Cup sailors – both past and present – and a more or less equal split in the fleet between pro helms and amateur owner-drivers. For owner-drivers the GC32 represents the rare opportunity to experience state-of-the-art foil borne racing, similar to that seen in the last two America’s Cups, together with 30+ knot boat speeds, but with standardised gear and for a fraction of the cost. In 2018 American Jason Carroll’s Argo finished fifth overall, but won the Owner-Driver Championship in a season that saw four different owner-driver teams claim this prize at individual events. The competition between the owner-drivers was spelled out at the end of the season when Argo came out on top, but a mere point ahead of Erik Maris’ Zoulou, in turn just two ahead of Simon Hull’s Frank Racing from New Zealand. This year will be Carroll’s fourth full season in the GC32 after first acquiring his boat in 2014 and trying out the GC32 Racing Tour for the first time in Cowes the following year. Since signing up to the circuit full time, the two time Melges 32 World Champion has claimed the Owner-Driver Championship in 2016 and was second overall in 2017, when he won his first event outright in Villasimius, Sardinia. For 2019, there will be some modifications to the Argo crew. Former America’s Cup skipper, and now one of the most experienced foiling sailors, France’s Sébastien Col steps into the tactician’s position while the other new recruit is Nick Hutton, long term crewman for Ben Ainslie’s America’s Cup challenge, INEOS Team UK. 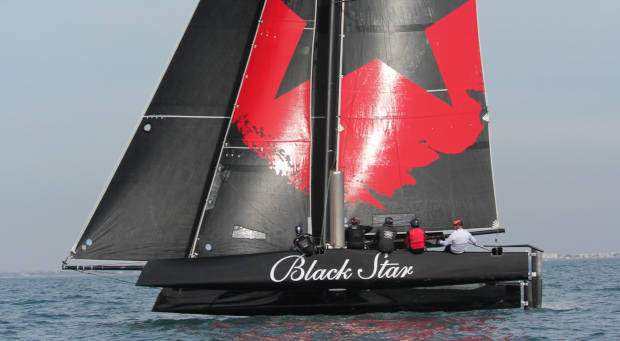 They join regular ‘Argonauts’ – former Luna Rossa America’s Cup crew and Extreme Sailing Series winner Alister Richardson and Scott ‘Chuck’ Norris, with Anthony Kotoun taking on coaching duties. Zuerrer is getting back into sailing after a hiatus for a few years. “I was looking around at what were good opportunities for a multihull sailor and the only boat I found that was suitable was the GC32,” he says. A trial run on the flying catamaran last year was enough to get him hooked again. For this season Zuerrer has chartered the GC32 of Marazzi, who will be helming while Zuerrer calls tactics and trims the mainsail. They are joined on board by Florian Trüb, who is part of Alex and Sébastien Schneiter’s Team Tilt squad and Adam Kay and Will Alloway, who campaigned INEOS Rebels on the Extreme Sailing Series’ last GC32 season in 2018. Coaching the team is Andrew Walsh. “I think the GC32 is great,” says Zuerrer. “It is a like a huge A-Class catamaran only with a jib and genniker too. The boat reacts like an A-Class so you have to steer really carefully and of course it just makes it fun to sail.” Already in training they have hit 31.4 knots.